Angad forces Guddan to marry him after Durga puja so she theatens to kill him. In the previous episode of Guddan Tumse Na Ho Payega, Guddan takes AJ out of the hospital and drives away with him. When Angad and Durga realize what happened, they go out searching for AJ and Guddan. When Guddan stops at a Durga temple to pray, Angad’s goons kidnap AJ again from the car. Then Angad goes back home forcing Guddan to marry him. In tonight’s episode, the entire Jindal parivaar goes out for the Durga Mata Visarjan. As per what Guddan said, she will have to marry Angad when the Durga Puja ends. Angad is happy thinking about that. Durga asks him where he has kept AJ. Angad tells her that AJ is in the base of the Durga statue that is being immersed in the lake. Durga is shocked and asks Angad to take AJ out of there. Angad threatens to kill her too if she makes a noise. Guddan is praying to Durga Mata asking her for a clue or any help to know where AJ is. At the same time AJ is struggling underwater trying to untie his hands. He is running out of breath and while he is drowing the Mata ki Chunni slips off his head and floats in the water. Guddan finds the chunni and goes deeper searching for AJ. When no one is able to see Guddan, they assume she went home. Angad goes home to prepare for his upcoming marriage. Guddan, meanwhile, brings AJ back to dry land where she tries to pump the water out of his lungs. She manages to bring AJ back to life before returning home. When she reaches home, Angad has already set up the mandap for their marriage. He was impatient for her to get home. He drags Guddan to the mandap to begin the marriage ceremony. Guddan stops Angad scolding him for his behaviour. 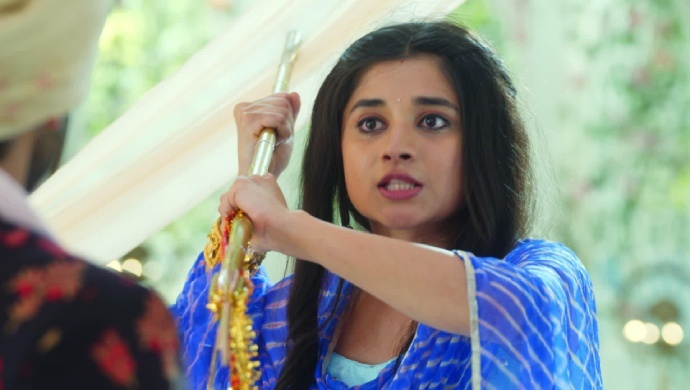 She takes Durga’s trident from the temple and threatens to stab Angad with it. Daadi stops Guddan from attacking Angad and tries to talk some sense into Angad. However, Angad pushes his old mother aside. Guddan is enraged by this and goes to attack Angad with the trident again. However, AJ steps in at that moment leaving Angad extremely scared. Will Angad finally pay for his crimes? Stay tuned to find out.